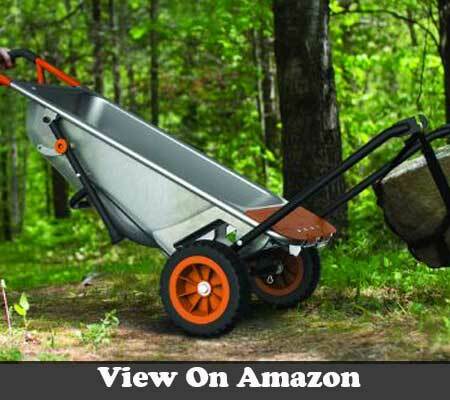 WORX Aerocart Multifunction Wheelbarrow – Check before decide! Gardening is enjoyable and funny but carrying gardening materials is quite laborious. Even, many interested people can’t come on stream because of transporting heavy loads of gardening materials. It is in point of fact that selecting best gardening wheelbarrow is a hassle among different wheeler, different materials and different users’ purposes. So, the best way to pick up your perfect gardening hand truck is to know your intention of buying. Hence, Worx Aerocart Multifunctional Wheelbarrow is the perfect solution for not only every purpose but also for all walks of lives. The multi-purpose Worx wheelbarrow will help you in easy gardening as well as get-at-able landscaping. I’d be happy to make you know that the Worx Aerocart multifunction wheelbarrow was named to the “Top 100: Best New Home Products on 2014” of This Old House’s list. Also, TOH, the famous magazine for better living and gardening, has referred WORX Aerocart as a “Gardener’s Go-To” tool for gardening. Its action speaks louder than words. I have been using Worx Aerocart Wheelbarrow since last year. And I am highly satisfied with Worx Wheelbarrow for its 8 in 1 tools’ versatility, rust-free, two-wheeler and unique patented design. Who Needs WORX Aerocart Multifunction wheelbarrows the most? WORX Aerocart Multifunction Wheelbarrow comes with 8 in 1 to make moving tools easily. The multifunctional wheelbarrow is a combination of Aerocart, plant mover strap, rock mover mesh, bag holder and cylinder holder. The multi-purpose wheelbarrow will help you perform various and wide-ranging tasks without the assistant of another moving tool. The simple design along with sturdy steel construction makes WORX Aerocart not only lighter in weight but also more durable for use. The exigent gardening tool is a composition of four other indispensable tools like a lever, axle and wheel and an inclined plane. The dimensions of the wheelbarrow are 42 x 12 x 18 inches with just 49 pounds weight. But the overall weight capacity of 300 pounds with such lighter tool makes it best wheelbarrow ever. Comfortable design to feel 200 pounds load like modicum 17 pounds, tested. When I started gardening a year ago, it was an arduous work to move large bags of soil, fertilizer, and manure. At that time, I didn’t use any wheelbarrow. But my friend asked me to use WORX Aerocart Wheelbarrow to move indispensable instruments for gardening. From then, gardening is easy and enjoyable to me. Like me, you, the conscious gardener, can use a wheelbarrow to move things. I’d like to say; the wheelbarrow will help you a lot for moving heavy things with less labor. Landscapers always need to transport small amounts to the working place from the stored place. As a landscaper, you can easily transport needed amount of sand, gravel or any other construction materials with rock mover mesh. Also, WORX wheelbarrow has extensive plant mover strap to transport small plants, shrubs and broken wood branches. You may kill two birds with one stone by using Worx wheelbarrow. Not like other wheelbarrows, WORX Aerocart Multifunction Wheelbarrow is exceptionally different for not only lucrative design but also the capacity of works. It makes transporting heavy goods easier ever. Also, the best wheelbarrow comprises three essential parts such as lever, axle and wheel and an inclined plane. It’ll help you carry up to 300 pounds which will be like measly 17 pounds. It is not just described in the product’s feature, but I have tested and felt the same experience. WORX Aerocart Multifunction Wheelbarrow comes with a 60-day refund policy. So the WORX give you a 60 day trial period of feeling and testing the capabilities of the wheelbarrow. If it does not satisfy your expectations, you will get back your money. A refund is unlikely though because you will be falling in love with it the moment you start working with it. For your WORX Aerocart Multifunction Wheelbarrow, you’ll get three years warranty from Positec Tool Corporation. For any failure or faulty materials of using the garden carriage, awesome customer support and service is ready for you. However, you’ll get fully repaired for all defective parts without paying the charge. Otherwise, you’ll be given a new or refurbished one in exchange for defective product. Sometimes, I need to move bulky items such as large bags full of mulch and dirt. So, it’s now a tiny work for me by using wheelbarrow extended dolly. You can also move colossal items by converting Aerocart to a dolly and moving the bottom flap down to make it a heavy duty hand truck. The garden carriage will help you move up to 300 pounds. A Fold Out extension helps me out when I need to carry oversized things. Overhanging will make the load tend to topple over meaning you will be struggling to find your balance. Balancing does not bother me. There is a system that is a product of some high-end physics that facilitates a self-Adjusting center of gravity. So cool I tell you don’t have to worry about loading while trying to find the point of balance. Plant and rock mover including the WORX wheelbarrow make it the best wheelbarrow for concrete. It has built-in mesh rock holder and potted plant mover to move heavy and all thumbs items. To move plant and rock, just strap the given potted plant into the plant mover and then hook up with the extended arms of the wheelbarrow. Your wheelbarrow is now ready to carry bulk plants and rocks. But remember that, the hand truck can carry up to 80 pounds of colossal items. The versatility of this wheelbarrow is amazing. It deserves the name multifunction. I get to use it as a dolly, cylinder carrier, and trailer tote among the eight function abilities. It incorporates all the features that facilitate its capabilities. For example, the ball joints that I use to attach it to a trailer. Plus it has the cylinder and bag holders, a strap for the plant mover and mesh for the rocks. Self-assembling will make you conscious about how the wheelbarrow works. Also, it helps to detect any malfunctioning in the future, though WORX wheelbarrow is about to free from malfunctioning. Assembling Worx Aerocart multifunction Wheelbarrow is easy without needing any heavy tool. Even a person, who is not playing with a full deck, can assemble it hassle-free. You just need a steel pin to assemble and mount the best heavy duty wheelbarrow. It’ll take around 30 minutes to assemble, and you’re now ready to go. To save you from the hassle and mindset of being extremely careful, and choose on the terrain, the manufacturers use flat free tires on this wheelbarrow. Flat free tires save you the extra dime on regular maintenance. It suits all type of terrains as it has some great clearance from the ground. The tire is also weather resistant as it incorporates some unique, awesome threads that will handle wet conditions well. One of the important factors in a wheelbarrow is durability. A product can have all the other impressive qualities, but without durability, they will not last. Steel construction gives you incredible strength. That is the reason it can hold just any load, but there is a limit to that. You can load it up to only 300 lbs. in general. Maintaining balance and stability for the wheelbarrow is a concern for the manufacturers. They have lots of innovations to make the wheelbarrow stable in transporting goods. But nothing has come without faultless. Hence, WORX Aerocart multifunction wheelbarrow has come with a unique and patented design to make transportation easier. The unique feature of the Worx wheelbarrow is its center of gravity which makes heavy loads feel like the cotton. Steel construction may get rust, not sure. Question: What are the dimensions of the WORX Aerocart Multifunction Wheelbarrow? Question: What is the actual capacity of the Wheelbarrow? Answer: The wheelbarrow comprises different modes such as a wheelbarrow, dolly, extended dolly, rock mover, plant mover, and cylinder holder. Each mode has separate capacity to carry quantities. For instances, WORX wheelbarrow can carry 300-lbs in wheelbarrow mode, 300-lbs in dolly mode, and 80-lbs for extended dolly, cylinder holder, rock mover and plant mover mode each. However, it is an amusing cart for household chores. Question: What is the size of the tires? Answer: the tires are of standard sizes. The width and diameter of the wheel are 3 inches and 10 inches respectively. Also, the overall width of the tire is 23 inches at the wheel. Question: what material is used to make of the wheelbarrow? Answer: A must-needed question for the wheelbarrow is its material. But you can’t hear it straight from the horse’s mouth as they don’t mention it on the specifications. However, the Worx wheelbarrow is made of a stainless steel frame which ensures rust-free and weather –resistant. It’s never been a painted steel to compose the wheelbarrow. But, I can’t assure you about the scratch. Question: Can I use it for moving patio furniture, refrigerator or stove? Answer: Obviously yes, why not! The wheelbarrow is the combination of 8 in 1 functions. So, you can use it for all the purposes of gardening to household chores. It has different parts for different works. For moving bulky items like patio furniture, refrigerator or stove, you need to use the fold-out extension. It allows hassle-free transportation of oversized items and quantities hassle free. Question: Will the wheelbarrow come pre-assembled? Answer: No, the wheelbarrow won’t come assembled. You need to assemble to use it. 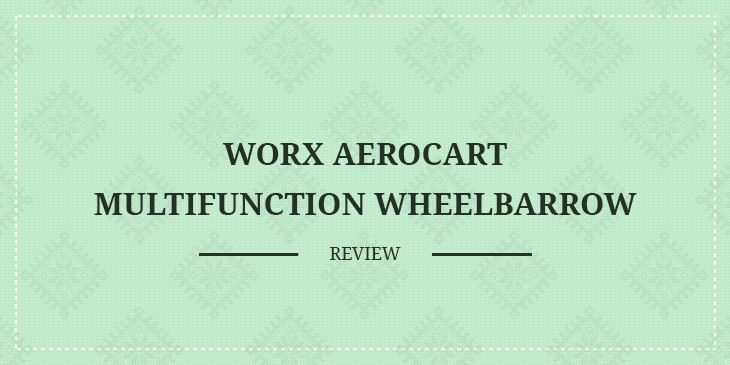 It’ll take less time to assemble the Worx Aerocart. Just set up the handle and hook the wheels. You’re ready to go now for using the world best wheelbarrow. You deserve to enjoy the ease of moving your stuff around the homestead and also for fairly long distances with the WORX Aerocart Multifunction wheelbarrow. I am not blindly being a fan of this particular product I have done all the due diligence, after weighing everything I can live with the shallow tub. The durable frame will see you through years of great service. If you can do some simple mathematics, you will see that after using it for a while, the money that it will save you outweighs the cost that you would have used moving the stuff plus its price. With a rating of 9.5, I say, it is high time you got one to fetch the music. how a lot attempt you put to make this kind of magnificent informative web site.